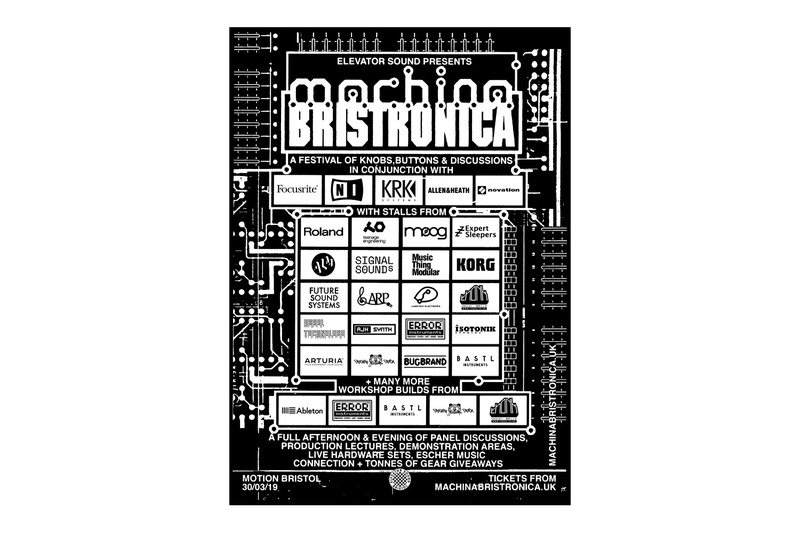 Elevator Sound, Bristol's fantastic go-to store for modular, synth and DJ equipment, has announced Machina Bristronica, a new one-day synth expo that's coming to the city in 2019. Inspired by shows like Berlin's Superbooth and the Amsterdam Dance Event, Machina Bristronica will take place on 30th March 2019 in Motion and The Marble Factory. The all-day event will see a range of software and hardware on show, with stalls from Ableton, Native Instruments, Moog, Teenage Engineering, ALM, Dreadbox and Bastl Instruments. There will also be a series of panel discussions, live hardware performances, DIY modular workshops, Ableton Live workshops, a 'Building Your First Max4Live Patch' class and "tonnes of gear giveaways." Tickets start at £16.99 and can be purchased here, and more artist and programming details will be announced in January 2019. It's another fantastic bit of news for Elevator Sound, who recently announced their merger with Cymru Beats, which will make the two stores into one of the largest stockists of modular gear in the UK. Interested in DJing, synths, plugins and electronic music production? Why not take a look at our hugely popular degree course at dBs Music?